Rassie Erasmus’ side got back to winning ways thanks to a powerful second-half display. Hanrahan scored two second-half tries after coming off the bench. 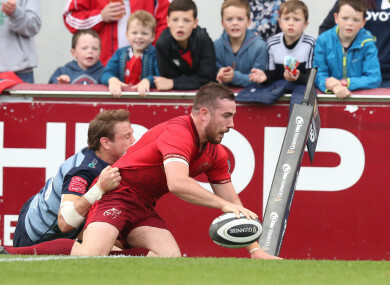 MUNSTER RETURNED TO second place in the Pro14’s Conference A as a dominant second-half was crowned by JJ Hanrahan’s brace of tries and a bonus-point victory on his return to the Munster shirt. Hanrahan was on the field for less than two minutes when he scored his first, and after Robin Copeland secured the bonus-point with his first try since last November, Hanrahan rounded off the scoring with his side’s fifth in the 72nd minute. The home side were brilliant marshalled by Conor Murray at scrum-half and Ian Keatley in the number 10 shirt, although the out-half’s perfect record from tee was spoiled by a late miss from the touchline. Last week’s heavy defeat to Glasgow was confined to history and Rassie Erasmus would be happy to see plenty of aggression in their play, strong scrummaging for his side and some excellent defence late on which saw Rhys Marshall and Liam O’Connor put in try saving tackles with the result already guaranteed. But the bad news from the afternoon was the leg injury sustained by Jaco Taute after 19 minutes. The South African was helped from the field after receiving lengthy treatment following a collision with Nick Williams as the big number eight carried the ball into contact. With so many changes and first starts of the season it was expected that Munster would struggle to stitch positive phases of play together and so it proved in the opening half as Cardiff bossed the bitty opening 40 minutes and led 16-13 at the interval. The scrum was one zone of the game that Munster dominated, but Erasmus’ side will be annoyed with the two lineouts that they lost on their own throw, while Cardiff also managed to gain good yardage off first phase moves. Last week Cardiff left the Sportsground with the win thanks to Jarrod Evans’ late conversion, and the out-half was on the mark again early on to give Cardiff a 3-0 lead after seven minutes, when Munster strayed offside. Six minutes later Munster took the lead when Murray took a quick tap penalty on the left, which almost saw CJ Stander cross, but the scrum-half was on hand to score at the base of the post, and Keatley’s conversion made it 7-3. South African referee Quinton Immelman played a big role throughout and clamped down on several breakdown infringements, and Evans kicked Cardiff to within one point when John Ryan was penalised for holding on after 20 minutes. With Munster defence coach Jacques Nienaber shouting instructions from the sideline, the home defensive line was well schooled, but Cardiff still managed to find a way through after 24 minutes. Rory Scannell shot out of the line, hit Steve Shingler hard and the ball squirted loose to Rhun Williams. Eventually Tom James broke clear down the left but was stopped by the scramble defence, although they could not slow the ball sufficiently and Josh Turnbull scored in the other corner. Evans’ conversion was followed by an exchange of penalties, with both kickers boasting a perfect record at the turnaround. The second period got off to a slow start, which wasn’t helped by a farcical seven-minute scrummaging session on the Cardiff line, which eventually saw tighthead Taufa’ao Filise sin-binned after three penalties were awarded against Cardiff. Another penalty was won by the Munster scrum, but they were then penalised for not taking the hit and Cardiff cleared their lines. But straight away Munster made their numerical advantage tell. Chris Farrell appeared to have botched a three-on-one in the left corner, but immediately John Ryan glided through the porous defensive line for a 20-16 lead after 52 minutes. The return of Hanrahan slipped under the radar after 54 minutes, but he was just on the field when he tracked Rory Scannell’s linebreak and gratefully accepted the run in, which stretched Munster’s lead to 27-16 when Keatley landed his fifth successful kick. And 12 minutes from time Munster wrapped up the bonus point when Murray danced down the short side but was held short, which allowed Copeland score from close range, while Hanrahan ran in a second eight minutes from time. MUNSTER: Andrew Conway (JJ Hanrahan 54’); Darren Sweetnam, Jaco Taute (Chris Farrell 20’), Rory Scannell, Alex Wootton; Ian Keatley, Conor Murray (Duncan Williams 73’); Dave Kilcoyne (Liam O’Connor 72’), Niall Scannell (Rhys Marshall 57’), John Ryan (Stephen Archer 61’); Robin Copeland (Mark Flanagan 70’), Billy Holland; Peter O’Mahony (c) (Sean McCarthy 74’), Tommy O’Donnell, CJ Stander. CARDIFF BLUES: Rhun Williams (Matthew Morgan 61’); Blaine Scully (c), Jack Roberts (Steven Shingler 16’), Willis Halaholo, Tom James (Keiron Assiratti 49-58’); Jarrod Evans, Tomos Williams (Lloyd Williams 71’); Brad Thyer (Corey Domachowski 70’), Matthew Rees (Ethan Lewis 61’), Taufa’ao Filise (Keiron Assiratti 58’); George Earle (Seb Davies 64’), James Down; Josh Turnbull, Olly Robinson, Nick Williams (Macauley Cook 61’). Email “Hanrahan back with a bang to hand Munster bonus point win ”. Feedback on “Hanrahan back with a bang to hand Munster bonus point win ”.